17 x 17' Master Bath space was chopped up with separate his/ hers ammenities ( his/hers Master closets and Dressing rooms). To achieve the drama and luxury appropriate for a home of this caliber, I converted this space into the one large glorious Boudoir Bath. By designing a separate HIS & HERS " SIDE " (each equipped with its own sink and cabinet space, vanity etc ) I achieved the symmetry that balances the room and offers the couple the separate spacial convenience that they requested requested.I added custom French doors leading to a beautiful pool/ outdoor living space. 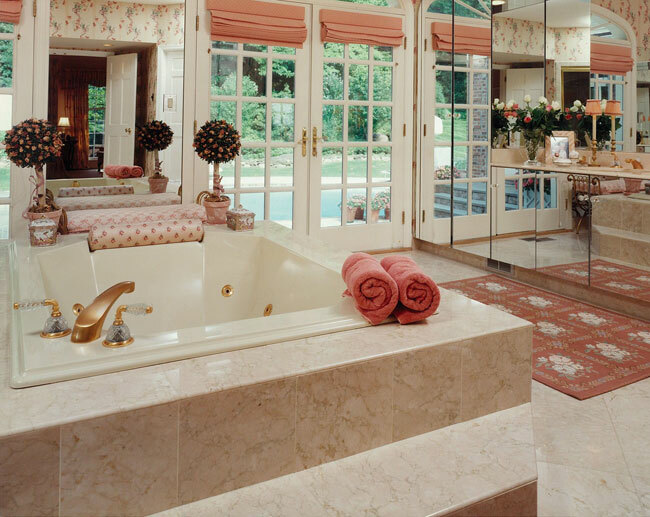 With a 6 x 6 ' steam shower with multi shower heads, and built-in marble benches, this bathroom defines luxury. The Water Closet and Bidet are enclosed in a space within the space.